In a large glass or stainless-steel bowl, combine the tomatoes, olives, feta, capers, parsley, salt, and pepper. 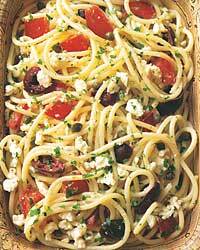 Spaghetti with Tomatoes, Black Olives, Garlic, and Mozzarella: Use 3/4 pound fresh mozzarella cheese, cut into 1/4-inch pieces, in place of the feta. Spaghetti with Tomatoes, Olives, Garlic, Feta, and Fresh Herbs: Use 1/4 cup chopped fresh basil or 3 tablespoons mixed chopped fresh herbs, such as tarragon and chives, in place of the parsley.